Queen’s Bath is located on Kauai’s North Shore, less than two miles from the St. Regis. 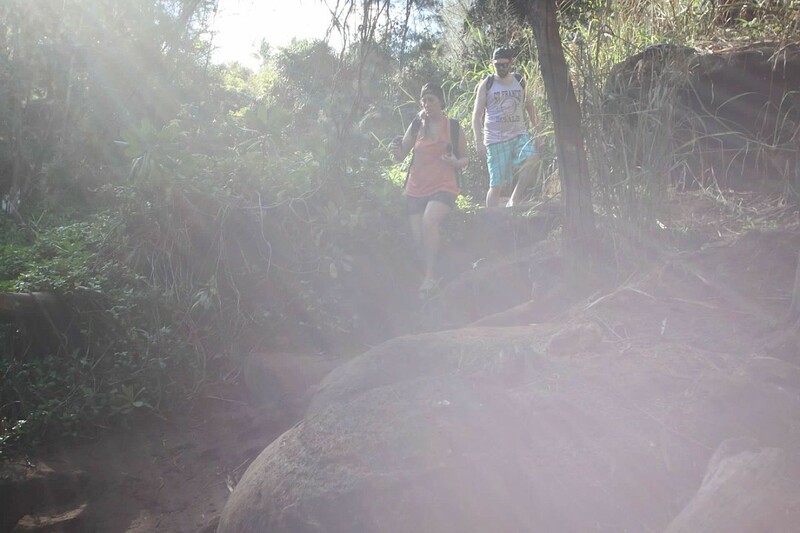 This wasn’t the easiest hike but it was worth every single second of the treacherous terrain. 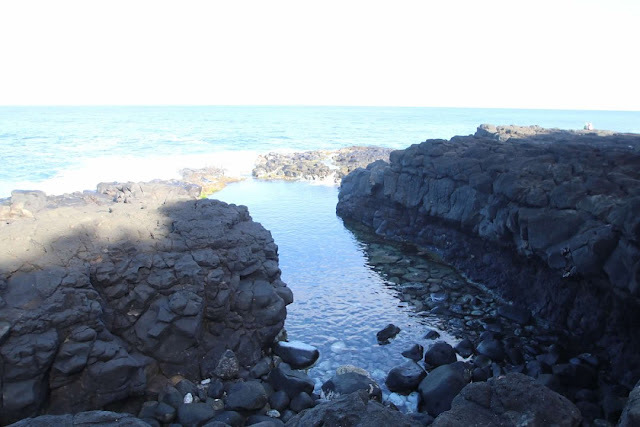 Queen’s Bath is a natural pool located on a lava beach and is part of a horseshoe shaped lava cut that is refreshed from an inlet from the ocean. If you are wondering if you are able to do the hike, do know a four year old, 55+ and a group of high maintenance gay men all completed the hike, so chances are you can too. 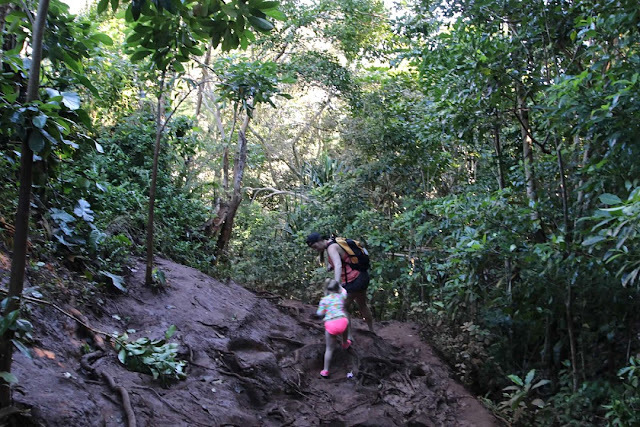 Just wear sturdy shoes, you don’t mind getting muddy, bring swimming/snorkel gear, and make sure you can hike hands free. 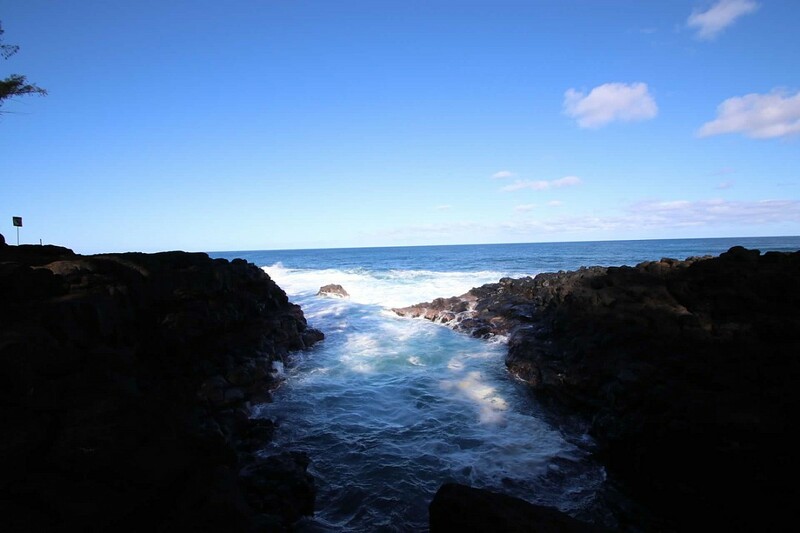 The path descends roughly 120 feet as you drop down to the lava rock, covered coastline. I was so proud of my girl for rocking out during the hike. She did better than my Mom who took a tumble 10 minutes into the hike. 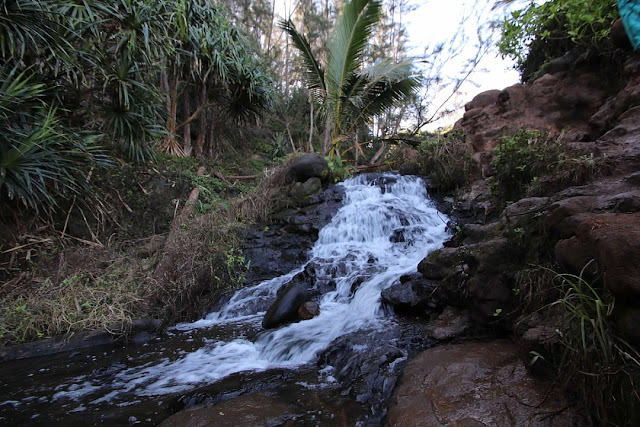 Queen’s bath is named after the Mother of Prince Albert, which is where the Kauai city of Princeville also get it’s name. 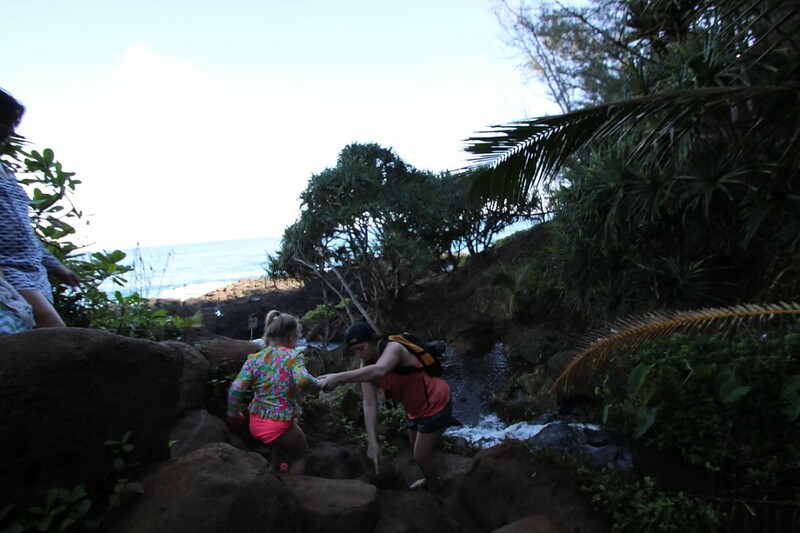 Before you reach the bottom of the hike where you will find the lava beach, you are rewarded with a gorgeous fresh water waterfall that empties into the ocean below. 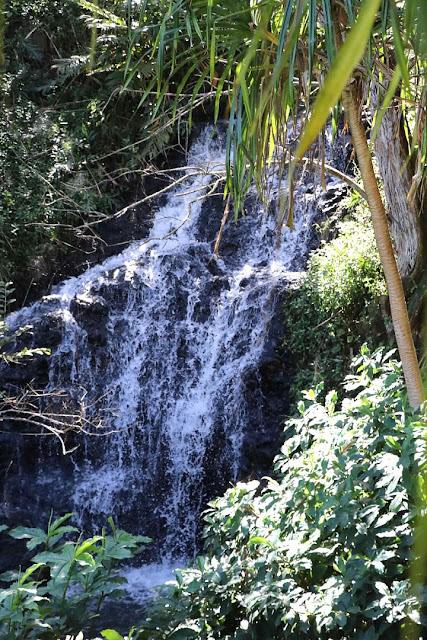 This is a good spot to wash off the salt water and mud on your hike back up. 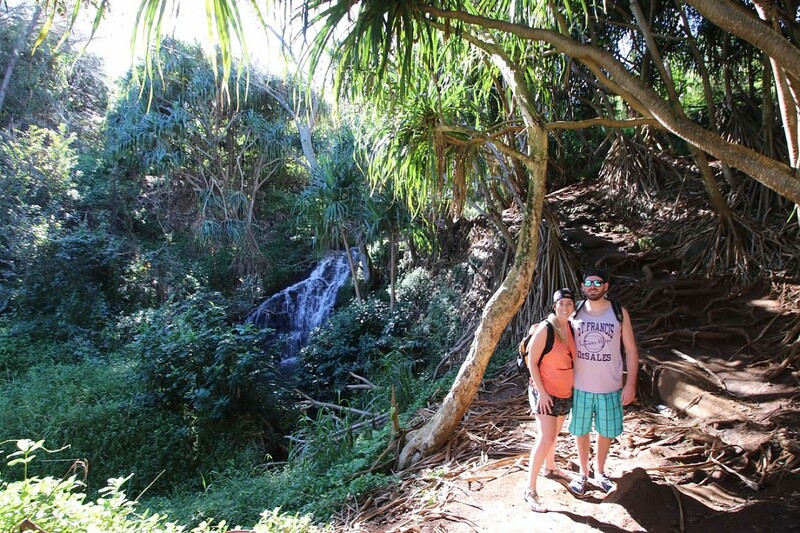 This was our first adventure and hike in Hawaii so when we stumbled upon the waterfall I thought we were done and the hike was over. Clearly, I am easy to please. 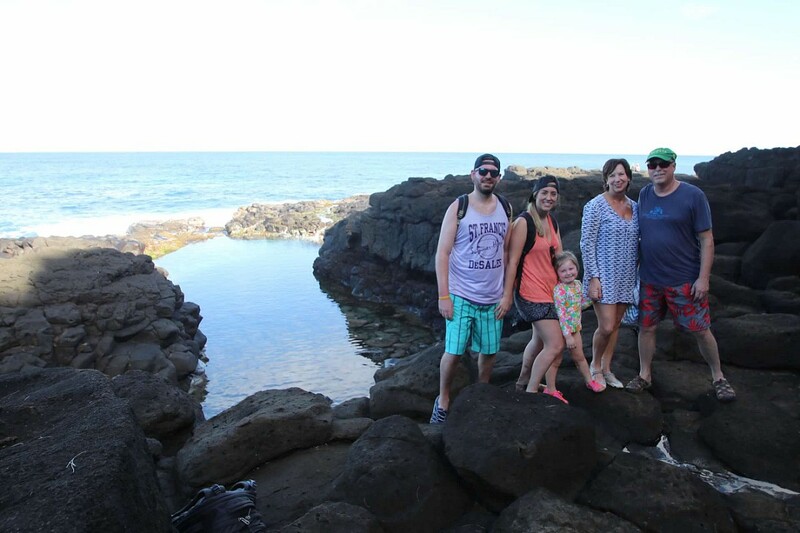 I assure you to keep walking, Queen’s Bath is worth it! When you reach the bottom of the hill, and the ocean comes into view there is a sign warning you of dangerous waters and currents. To add to the warnings of danger there are marks carved into a wood panel to indicate the number of drownings that have occurred. The guide books all note that it has been discussed several times to close the path and not make mention of this attraction publicly because of how dangerous it can be. I was impressed with Evelyn’s ability to hike the steep and uneven trail but from the looks of the water and the warnings ringing in my ear, I was very skeptical anybody who shared my last name would be getting in the rough looking water. I promised Evelyn swimming the entire way down during the hike so I was really hoping we stumbled upon something much more accessible and calm. 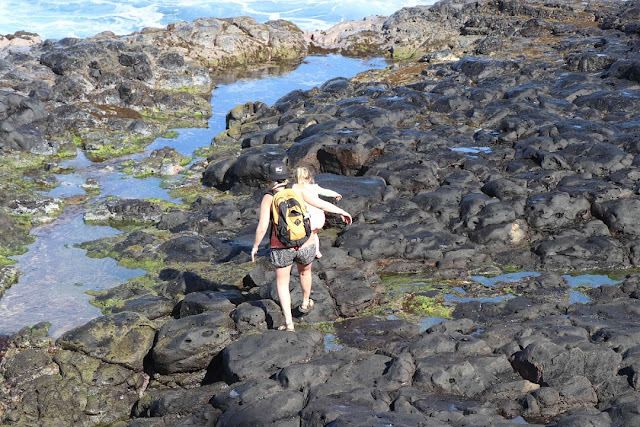 The travel books also say this is a summer only excursion because in the winter months the tide and currents are extremely strong. 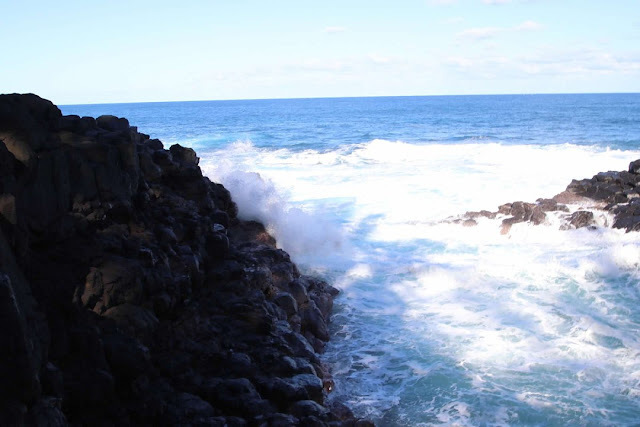 As well as the waves that suddenly wash over the rocks and can leave you unbalanced. 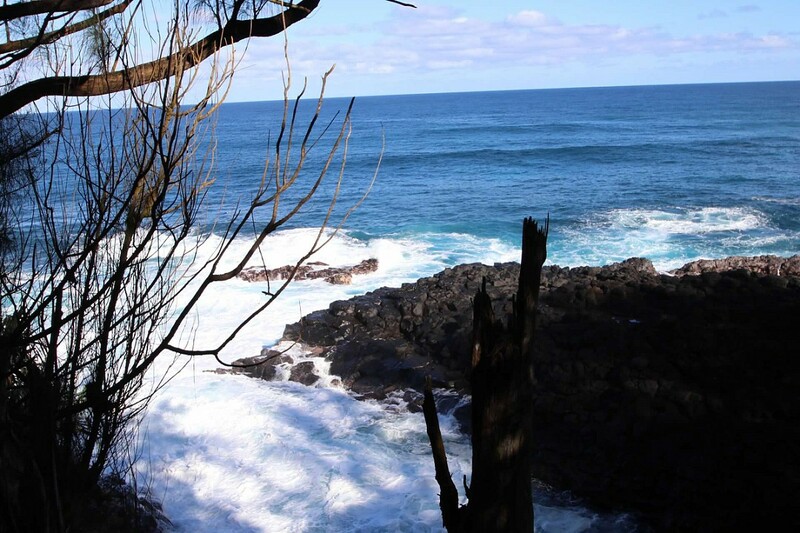 To be sure Queen’s Bath is safe to visit it is best to check the surf report, anything reporting three feet or less should be safe enough conditions to make the trip. Once you reach the lava rocks, Queen’s Bath is an estimated 260 yards further. People say it feels further and they are right, as you are walking you keep feeling as if every little pool you come upon has to be it and that you have surely some how missed it. I assure you we must have had a calm day because if it appeared at all unsafe we would not have gotten in the pool. It is easy to see how on a rough day, walking along some of the outer edges, if you were not paying attention and a wave came up and took you off guard, you could easily get injured on rocks and swept back out. 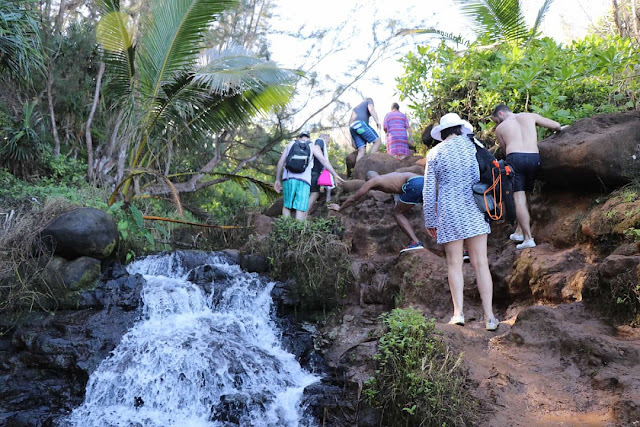 If I remember correctly I think around 29 people had lost their lives at Queen’s Bath. Take heed of all warning signs! We finally found it and it was cool, calm and inviting! There was no holding Evelyn back from getting in that water. It was gorgeous and so serene. 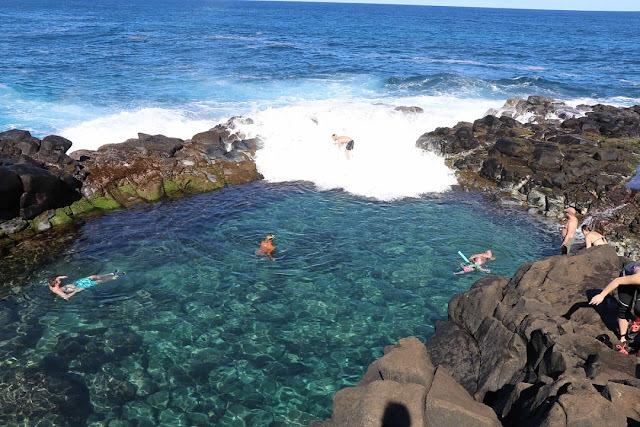 The water is clear as glass and the big boulders and lava rocks create the most picturesque pool. 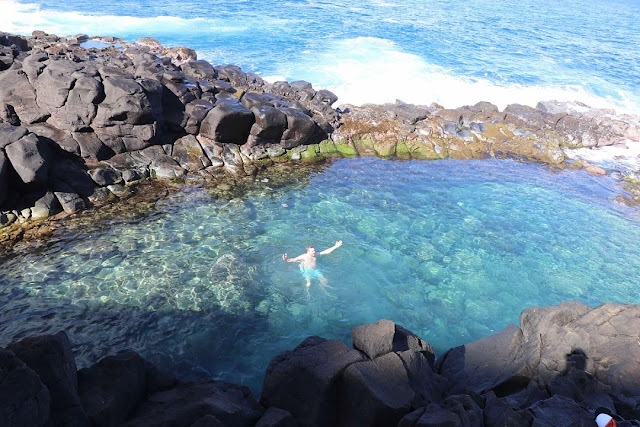 Manfriend feeling like the King of the World floating in Queen’s Bath. That’s Drew, literally being rocked by a wave. 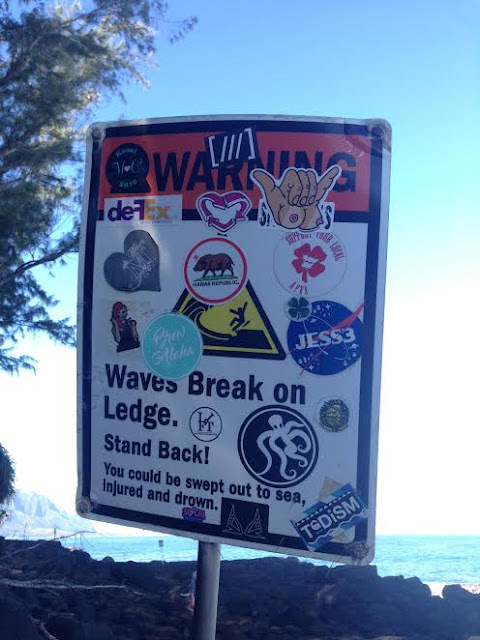 Drew, did not take heed of the warning signs and was yelled at by lifeguards and your’s truly for not minding warnings and currents all over Kauai! 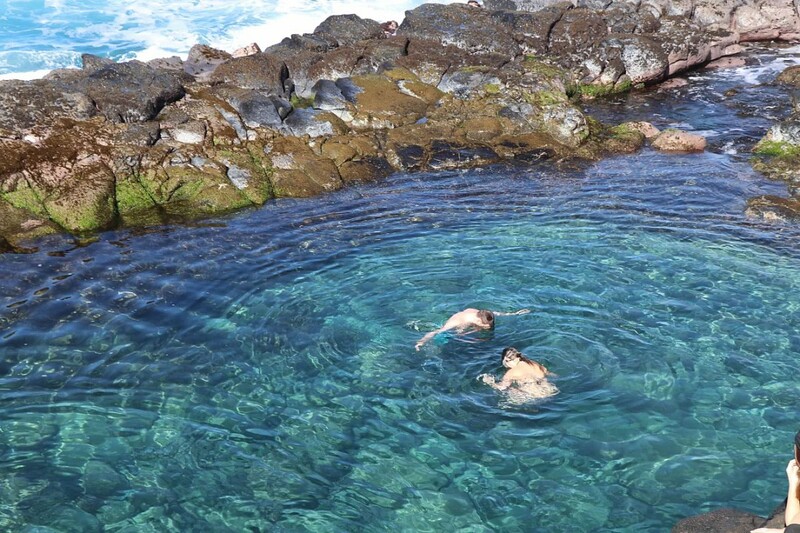 I love this picture of Zach and I scoping out the Queen’s Bath scenery, under water. There is so much to see in the ocean filled pool. Because of the inlets all kinds of sea life gets washed into the bath. The water is deep although it doesn’t immediately appear deep because it is so clear. In some spots it was easily up to 15-20 feet deep. 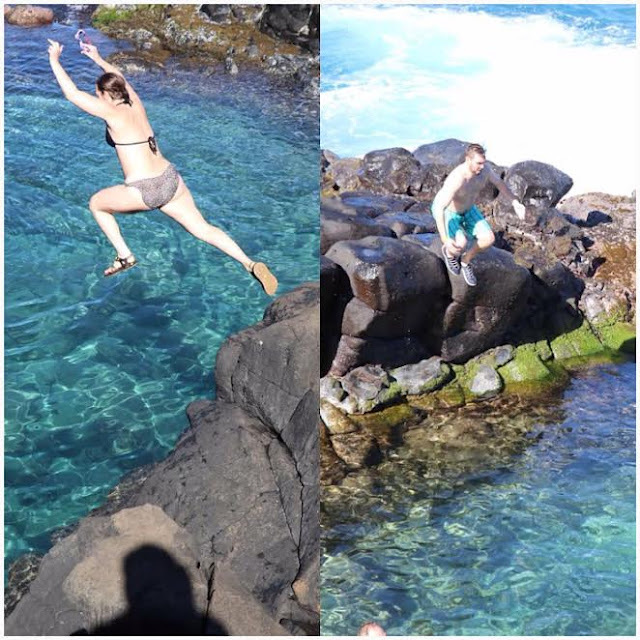 15-20 foot deep water meant one thing, cliff jumping! Do I look like a Mermaid? HA! Then there is the hike back up. It wasn’t nearly as bad going up as it was coming down. Some of us struggled more than others. 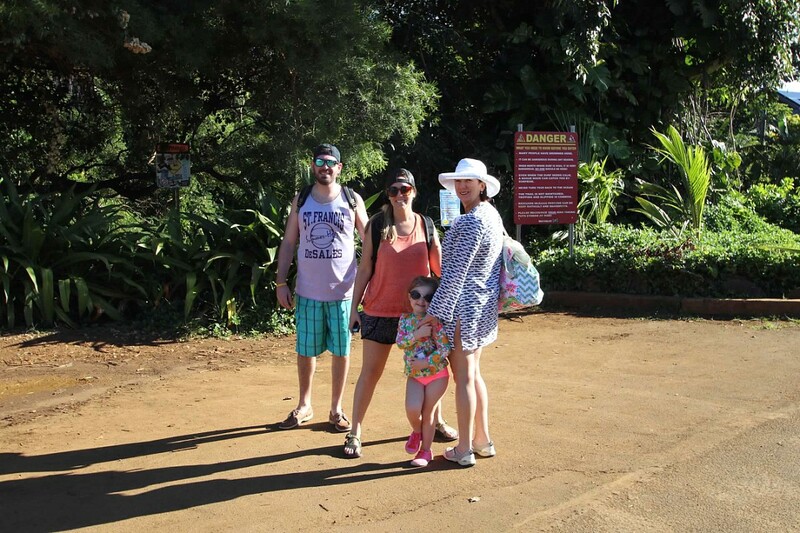 If you visit Kauai especially during the spring/summer months when the waters are calmer, I would consider it a must see of the island, especially if you are into snorkeling. My biggest piece of advice for the adventure is to make sure you wear shoes that are sturdy that make it easy to hike in and that can double as a water shoe. 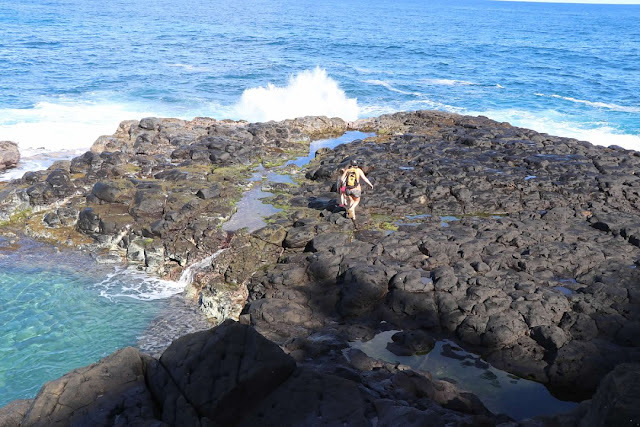 If you plan to swim in Queen’s Bath you are not going to want to go barefoot as the lava rocks can be jagged and very slippery.